VIM is an awesome text editor and syntax highlighting is one of its many awesome features. To enable VIM syntax highlighting globally for all users, simply uncomment Syntax on in the VIM config file (which is typically /etc/vimrc). But that gets old quick, and so I'm going to setup VIM to automatically highlight the syntax for this file. First, make sure your VIM version supports syntax highlight by turning it on manually. If VIM complains, you probably just need to update to the latest version (using whatever software update facility is appropriate for your Linux distribution). The above will use cpp (e.g. C++) syntax highlight rules for files which contain .boot in the filename (like Vyatta's config.boot). 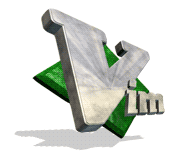 There are other ways to identify the file besides the file name, just take a look at the VIM documentation. Also, if none of the provided syntax highlight rule sets work for you, you could define your own. I haven't had the need to do that (yet? ).